Superconductivity is a quantum phenomenon that manifests itself in materials showing zero electrical resistance below a characteristic temperature resulting in the potential for an electric current to run continually through such a material without the need for a power source. Such materials are used extensively in medical and power applications, e.g. MRI and NMR machines. Discovering Superconductivity uses a series of practical and investigative activities, which can be used as tutor demonstrations or as student lab exercises. 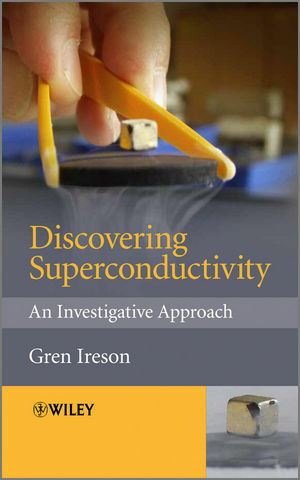 This text will serve as an excellent introduction for students, with or without a physics background, to superconductivity. With a strong practical, experimental emphasis, it provides readers with an overview of the topic preparing them for more advanced texts used in advanced undergraduate and post-graduate courses. A word from the author: "The intention of this text is to introduce the reader to the study of superconductivity via a minds-on approach .... The minds-on approach takes this a stage further by requiring the learner to engage with the process to a greater extent." Professor Gren Ireson is Professor of Science Education and his research interests include the learning and teaching of particle physics, quantum phenomena and superconductivity. He teaches an undergraduate certificate course, delivering particle physics, astrophysics and quantum phenomena. For the past seven years he has been involved in pan-European projects developing electronic resources, paper resources, training materials and novel investigations for the learning and teaching of superconductivity. This work, currently ongoing, is based on four EU funded projects. In addition to delivering this material to undergraduate certificate students the author has delivered the material to advanced school teachers, post graduate scientists [non-physicists] and to students and faculty within the School of Science and Technology at Nottingham Trent University.